Longtime New England chain owned by Ahold. Many stores are former First National locations. Stop & Shop’s roots can be traced back to 1914, when the Rabinovitz family founded the Economy Grocery Stores Company in Somerville, Massachusetts. Four years later, family member Sidney Rabb introduced an idea new to retail: the self-service, modern supermarket. 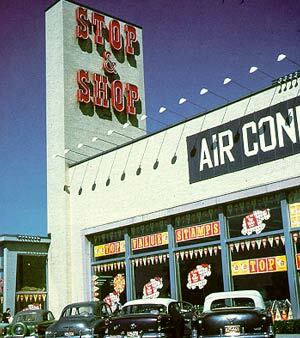 By 1947, Economy Grocery Stores had grown into a flourishing chain of 86 supermarkets and the name of the company was changed to Stop & Shop, Inc. In the 1980s, Stop & Shop pioneered the superstore concept in New England, opening the first Super Stop & Shop in 1982. In 1996, Stop & Shop was acquired by Ahold, one of the largest food retailers in the world. Worldwide, Ahold employs 450,000 people and services the needs of 40 million customers in 28 countries every week.